Posted October 3, 2018 by lauterbachadmin | cs5711, Uncategorized. Nothing affects wineries more than the weather. At this time of the year that means the Grape Crush. Grape Crush is an annual right of passage, the date which cannot be scheduled, but must be planned. We usually have 3 to 4 days warning, and It happens fast. 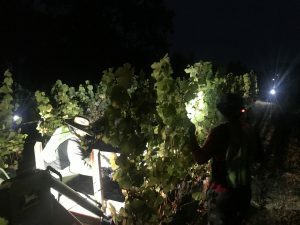 At Lauterbach Cellars the Harvest happened last Saturday, September 29, 2018. The crew started early, last Saturday at about 6:20 AM. We harvested about 4.7 tons for a winery we sell fruit to, followed by 4 tons for ourselves. We harvest early so fruit comes in cold, preferably 55-65 degrees Fahrenheit. The vineyard workers also like to work in cooler weather. They like to beat the heat of the day, as they work more efficiently, since they get paid by the number of tons picked. 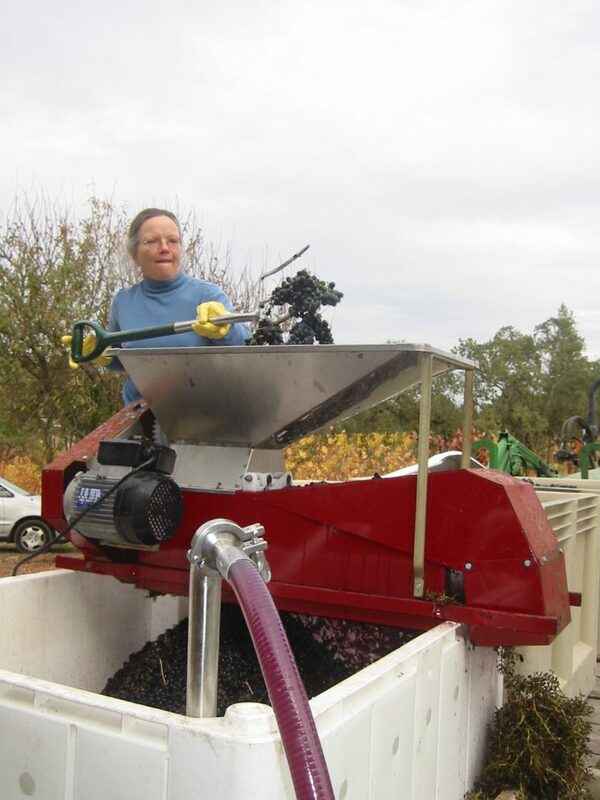 After sitting over night in the winery the grapes were run through a “stemmer”, where the grapes are knocked off the stems and fall into a fermenting tank. The “must” is then moved into the winery for fermentation. About 3 days of “cold soak” the yeast will be inoculated into the “must”, and the fermentation process begins. The “must” is “punched down” 2 to 3 times a day for about 2 weeks, until all of the sugar is fermented to alcohol. The grape juice is now wine. After the juice has fermented to wine, we pump the “free run” (the wine that comes out before the press) out of the tanks and into barrels. 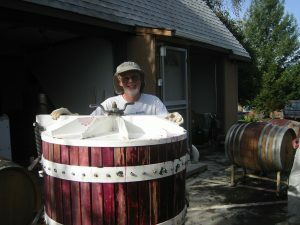 The remaining skins are then pressed to yield the “press fraction”(wine that is obtained from the press), which goes into barrels, where they will age for a year. The free run is usually delicate and fruity. The press fraction is more astringent and tannic. When blended they, together, are better than either alone. It’s hard to believe, but if you ever stop by we’ll barrel taste the differences and blend.